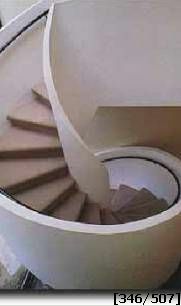 Stairways Inc. will produce spiral staircases, straight stairs or curved stairways to your specifications. Spiral stairs, both welded and kit models, can be customized using our standard components. Curved stairs and straight stairs can also use spiral stair standard components, such as, steps, balusters and handrails. Many times potential customers have seen photos on the internet and email these ideas to our sales staff. We can help to see if your dream designs are feasible.